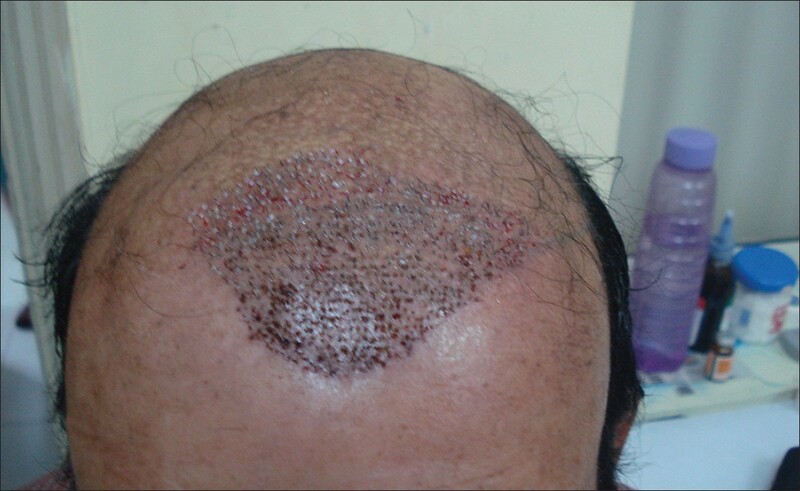 Hair transplantation is an accepted technique of restoring hairs on bald scalp in pattern baldness, by different techniques such as follicular unit transplantation, follicular unit extraction (FUE), etc., However, one of the limiting factors in achieving successful outcome is the limited donor hair on occipital scalp, particularly in extensive baldness. Body hair has been proposed as an alternative source of hair in such cases. Body hair has been shown to grow longer when transplanted to scalp, as a result of the influence of scalp dermis on the transplanted hair, referred to as recipient influence. However, proper studies of successful body hair transplantation are yet to be documented and PubMed search revealed only few published case reportsr. ,, We report the outcome of transplantation of hairs from different areas such as chest, abdomen, arms, back, and thighs in a patient. 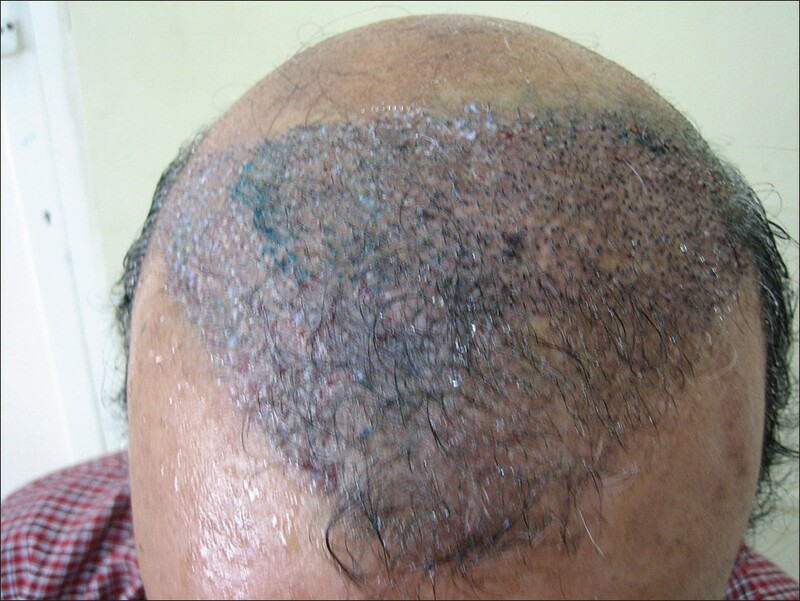 A 63-year-old male presented with extensive baldness. Further, he gave history of previous punch transplantation 18 years back, which had failed to give satisfactory results. Occipital scalp examination showed multiple punch scars and poor density, of only 41 follicular units/sq cm. 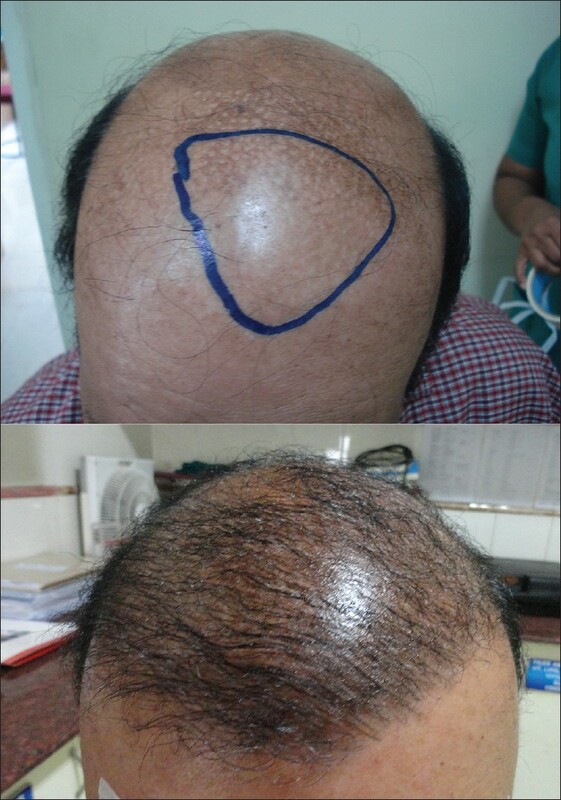 He was counselled about the poor donor area on scalp and was advised against a transplantation. He was determined to have a transplantation and requested for body hair transplantation, as he had good body hair and had read about the procedure on internet. Detailed counselling was done about body hair transplantation, detailed history taken, general examination performed to rule out any contraindications for the surgery. Investigations including blood counts, sugar, liver and renal function tests, electrocardiogram were within normal limits. Informed consent was obtained and preoperative photography performed. A test graft session by FUE technique was performed to determine its feasibility with 400 units from chest [Figure 1]. The hairs showed satisfactory growth after 5 months and after detailed counselling, larger sessions were planned. Initially, the procedure was planned under local cream anaesthesia, using eutectic mixture of lignocaine and prilocaine. However, this proved inadequate in relieving intraoperative pain and it was therefore decided to use tumescent anaesthesia, which was administered as per standard guidelines. FUE was performed by using a automated extractor with 0.9-mm punches. Sessions were performed from different areas, such as chest and abdomen [Figure 2], arms, and thighs on different dates as shown in [Table 1]. [Table 2] shows characters of body hair, such as density and length from different areas. Rate of transection during extraction from different body parts is shown in [Table 3]. Extracted grafts were kept in ringer lactate solution [Figure 3] and then transplanted in to the frontal, parietal, and vertex scalp [Figure 4]. Donor sites healed quickly in 2 days [Figure 5]. 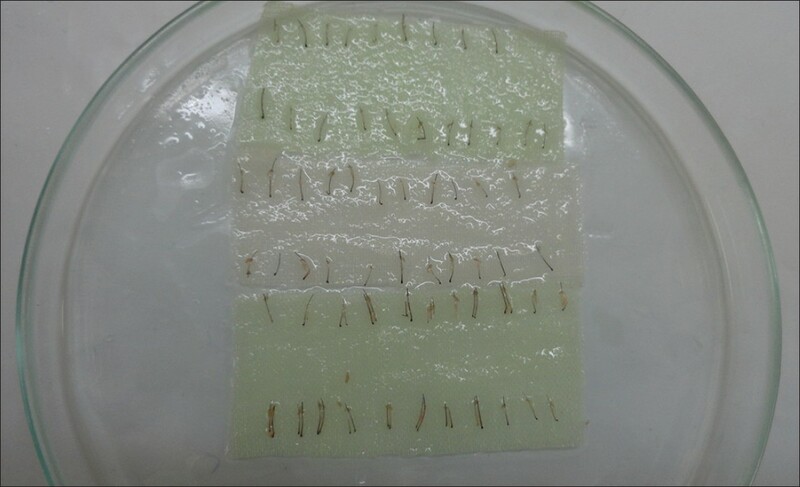 The grafts started growing on recipient area from fourth month onwards and reached a length of 3-4 cms by 8 months [Figure 6]. [Table 2] shows length of the grafted hairs after transplantation in to scalp from different areas. Yield (ratio of hairs growing after transplantation and the number of grafted hairs) after grafting from different body areas is shown in [Table 3]. Patient was satisfied with the results. The patient has been followed up for a period of 24 months after the first session and 8 months after the last session. The patient's appearance has altered so much that he has had to change his passport! Body hair transplantation is a relatively new surgical technique used for hair restoration. The scientific basis for the procedure is provided by the concept of recipient influence, which suggests that dermis in the recipient area may exert influence on the growth pattern of transplanted hair and hence when body hair is transplanted on to scalp, it would grow longer, thicker. The rationale has been confirmed in a few published reports. ,, Further, since the procedure is performed by extraction method which produces very small scars, and body is a cosmetically less significant area, body hairs can help to provide an alternative source of donor hair in selected patients. This is particularly so in Indian patients, who do not expose body in public as sunbathing so common in the west, is not popular in Indians. Our report represents additional proof that body hair indeed can be a valuable alternative source in patients who lack scalp hair. The procedure is possible only in patients who possess good body hair, as in our patient. His chest hair density was particularly good, with density of 22 units per sq cm (roughly half the occipital area density). Routine methods of anaesthesia such as infiltration and blocks are not useful and hence the procedure can be painful. This was indeed so in our patient and hence tumescent anaesthesia had to be followed, which provided pain-free surgery. Only the FUE method is suitable for harvesting body hair. This makes the procedure slow and painstaking. Body hairs are usually found as 1 and 2 hair units, and hence the density and thereby results achieved may not be as impressive as with scalp hair [Table 2]. Body hairs are shorter in length, are thinner and hence their extraction needs special technique and expertise. On an average the roots were located at a depth of only 3-4 mm. [Figure 3]. Transection rates therefore are higher. The transection rates varied in our patient [Table 3] from 13% to 32%. Chest hair showed the least transaction rate, while back, arms, and abdomen showed much higher transection rate. However, since the patient was not bothered about loss of body hair, the cosmetic impact of transection was not relevant to the patient. Lastly, strong evidence for the procedure is lacking; published reports are few and represent isolated case reports only. Hence the procedure should be performed only in selected patients, in those who are well motivated, and after proper counselling and consent. This was indeed done in our patient, with a test grafting being done initially and separate special consent obtained. The yield has been a matter of concern and no published data exist. Our case showed variable yield in grafts from different areas, the least yield was from back (29%), while the best yield was from chest [Table 3]. However, even the chest hair yield was much below that would be expected from scalp hair. The length of hairs after transplantation of body hair is a matter of debate, though it is thought that hairs grow longer on scalp. This is borne out to some extent in our patient, though the growth was only marginally higher than the length over the body hair. Chest hair grew best and longest, by about 2 cms longer than the growth on chest. Analysis of data showed that chest hair is the best of the different body hairs. It has best density, least transection, highest yield and longest growth after transplantation. The back, abdomen and arms cannot be considered as suitable hairs. We used tumescent anaesthesia in our patient-this is very helpful as the method helps to provide anaesthesia over a larger area, as it lasts longer, and is safer than using large doses of lignocaine by local infiltration. The method of extraction is similar to the one on scalp, but since the body hair is thinner and is located more superficially, the extraction has to be done more carefully. The extraction sites heal very well, over 2-3 days. Patient needs to be given postoperative antibiotic and analgesic for this period. The long-term of outcome of body hair is yet to be determined, as the procedure is only a few years old. In our patient, it is only 24 months after first session and 8 months from last session and hence this is a limitation. It is also not known whether the method would work consistently in all patients and hence proper case selection and counselling of the patient is very important. In summary, body hair can be an alternative source in highly selected patients, with poor donor scalp and good body hair. Chest hair is possibly the best among the different body sources, but even this chest hair growth and yield is moderate. Proper counselling is essential before performing the surgery. The method needs to be established properly with more data to define its role and hence the author strongly feels that the current trend of publicizing it on internet websites is unjustified and should be discouraged. 1. Woods R, Campbell AW. Chest hair micrografts display extended growth in scalp tissue: A case report. Br J Plast Surg 2004;57:789-91. 2. Hwang S, Kim JC, Ryu HS, Cha YC, Lee SJ, Na GY, et al. Does the recipient site influence the hair growth characteristics in hair transplantation? Dermatol Surg 2002;28:795-8. 3. Meyer-Gonzalez T, Bisanga C. Body-hair transplant for cicatricial alopecia. Actas Dermosifiliogr 2012;103:163-4. 4. Poswal A. The preshaving protocol in body hair-to-scalp transplant to identify hair in anagen phase. Indian J Dermatol 2010;55:50-2. 5. Jones R. Body hair transplant into wide donor scar. Dermatol Surg 2008;34:857. 6. Mysore V, IADVL dermatosurgery task force. Tumescent liposuction: Standard guidelines of care. Indian J Dermatol Venereol Leprol 2008;74:S54-60.